You know when you find a recipe and once you try it, you can’t imagine how you ever lived without it? Well, Poor Girl Eats Well’s Not Quite Minestrone Soup is my new damn-near obsession. It is ridiculously easy to make and I’m sure it will help keep us healthy in the upcoming cold and flu season. Plus, it’s dairy free and full of Israeli couscous. So really, what could be better? Without further ado, I bring you Not Quite Minestrone Soup. Recipe is so close to the one from Poor Girl Eats Well, click over there to see what’s up. I always use canned diced tomatoes. Ruby won’t let me keep fresh tomatoes in the house because she eats them too fast. Since she hasn’t quite figured out the can opener yet, we’re safe for now. The zucchini was in one time and out another without a huge difference. One time I totally forgot the spinach and it was still delicious. Remember how I’m totally obsessed with Israeli couscous? Well, I still am and therefore double the amount in the recipe making more of a stew and less of a soup. I’m pretty sure there isn’t any way to mess this soup up. Make it often. I will be sad when it is too hot to eat this soup. What’s for dinner at your house these shorter, cooler days? Not really feeling this recipe? You can always visit the recipe archive for more dinner ideas. 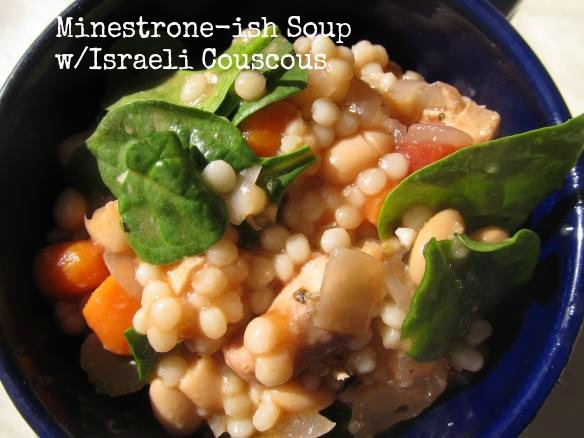 This entry was posted in Recipes and tagged chewy soup, chicken soup, Fall food, fast and healthy, israeli couscous, minestrone soup, Poor Girl Eats Well by Teacher Goes Back to School. Bookmark the permalink. Did you make this with Chicken? If so, how did you cook the thighs? I do. I bake thighs with garlic powder, oregano and Basil.